I have been craving comfort food. I don’t know if it’s the break from the extreme heat (we’ll have a “cold front” this week with highs in the 90’s) or that school will be starting soon and that makes me think of fall. 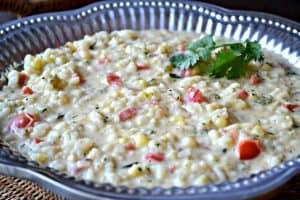 This is a great creamy “comfort food” dish that uses summer corn and tomatoes and goes well with just about anything. Pair it with grilled meat, fajitas, or just add a salad. Be sure to use fresh corn and tomatoes. This recipe is a little more work because you have to roast the pepper, but it is worth it! Place the Poblano pepper on pan and broil on all sides until it is black and blistered. Each side takes about 2-3 minutes. Remove from oven and place in a paper bag to cool. While the Poblano is cooling finely chop your onion, seed and dice tomato and cut corn off of cob. Remove the Poblano from bag and take off black blistered skin, remove the seeds and dice. Combine chicken broth and milk in a saucepan and heat until almost boiling. Keep warm. Melt butter in straight sided large skillet over medium heat. Add onion and the poblano and sauté until onion is soft, about 2 to 3 minutes. Add Arborio rice and garlic and sauté stirring constantly until rice is opaque, about 2 to 3 minutes. Add ½ cup hot chicken broth and milk mixture. 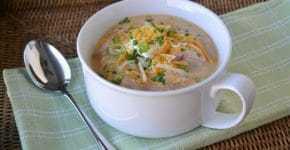 Continue cooking over medium heat adding broth ½ cup at a time after liquid is almost absorbed. Stir frequently. Add corn with the last ½ cup chicken broth and milk. Add tomatoes and stir until heated through. Stir in Parmesan cheese. Remove from heat and add cilantro. Salt and Pepper to taste. Let sit 5 minutes. Thanks for another great recipe. Pinned! Thanks so much for linking to Saturday Dishes. I have chosen to feature your recipe today on HammockTracks.